There is no need for exaggerated panic over global developments and investors should keep in mind inherent strength of Indian economy, Jaitley said. Finance Minister Arun Jaitley reportedly said that major sell-off in global markets created chain reaction that impacted Indian equities. There is no need for exaggerated panic over global developments and investors should keep in mind inherent strength of Indian economy, Jaitley reported. 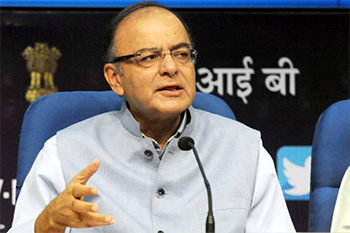 Jaitley added that Government s considering more steps to empower banks to recover bad loans. Idea Cellular, Tata Motors, Bharti Airtel, Cairn India, M&M, Axis Bank and NTPC were among the gainers on NSE, whereas BHEL, BPCL, PNB, Adani Ports, ONGC, Hindalco, L&T, ICICI Bank and Tata Steel were among the losers today. Finally, the BSE Sensex opened at 23,060, touched an intra-day high of 23,161 and low of 22,600. It finally ended with a gain of 34 points at 22,986. The NSE Nifty opened at 7,023 hitting a high of 7,035 and low of 6,981, before ending with a gain of mere four points at 6,981. The India VIX (Volatility) index was up 7.25% to 21.7275. Out of 1,788 stocks traded on the NSE, 1,113 declined and 430 advanced on Friday.